5 Books to Understanding China and its Internet Economy, including Implications for the Cryptocurrency Ecosystem – We help you think smartly about the crypto and blockchain landscape in Asia 5-10 years out. What should we do while we are in the bear market? Read! Cryptocurrency and Blockchain is a new line of technology innovations that will change our society, similar to AI and self-driving cars. But given the multidisciplinary nature of the space, understanding the basics of how government, economies and societies work is crucial and fundamental to shaping our outlook for how cryptocurrency and blockchain will influence and truly impact the world. Current Crypto-oriented educational and learning resources tend to be short-form pieces published on Twitter or in Medium, but in order to really fully understand a topic, books are a better way to go. We have rummaged through the entire collection of English language books written on China, and we present you the top 5. Having these 5 at your disposal will help you understand the past and present of this rapidly changing society. As China has risen to become of the most powerful technology-enabled country in the last decade, understanding the basics of how government, culture, economies and societies operate in China is crucial and fundamental to shaping our outlook for how cryptocurrency and blockchain will influence the globe. And for disclosures, by clicking on the links below, we will receive a small affiliate fee. China under the current leader Xi Jinping has been more powerful and ambitious than ever before. This book is particularly relevant to read if you want to understand present-day China. Written by a Chinese scholar, the book details the set of political and economic reforms since Xi took over, including the centralization of power under himself and the expansion of the Communist Party’s role in Chinese political, social, and economic life, and the construction of a virtual wall of regulations to control more closely the exchange of ideas and capital between China and the outside world. 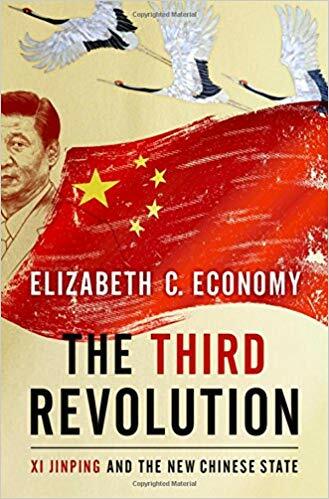 Through highlighting Xi’s priorities and agenda in office, including fighting corruption and getting rid of his enemies, managing the Internet and reforming the state-owned enterprise sector, the author identifies the tensions, shortcomings, and successes of Xi’s reform efforts over the course of his first five years in office. More relevantly, as internet control and citizens’ data management become an increasingly larger focus for the central party, this book indirectly lays a solid backdrop for why the government is so pro-private blockchains in the first place. I really enjoyed reading this book. It’s a very straightforward and fascinating read in which you don’t need to know economics to comprehend. Among the many topics discussed in the book, the China stock market is one of them. The stock market in China is a recent phenomenon and I couldn’t help but draw many parallels of its infancy with the current crypto market. Nonetheless, the most interesting and important discussion is around how China was the astonishing economic growth story of the last three decades. In the 1980s, China was an impoverished backwater, struggling to escape the political turmoil and economic mismanagement of the Mao era. Today it is the world’s second-biggest economy, the largest manufacturing and trading nation, the consumer of half the world’s steel and coal, the biggest source of international tourists, and one of the most influential investors in developing countries from southeast Asia to Africa to Latin America. I haven’t honestly found that many great China-tech related books as comparable to a book say like Bad Blood about Theranos or on Elon Musk or on Uber, which is unfortunate. Given that China technology companies really only surfaced globally in the last decade, this book by Edward Tse provides a solid compilation of the large tech companies in China operating currently. Additionally, we will share with you to a number of other resources to understand these recent phenomenon in the form of shorter write-ups and media contents. The book combines the history of entrepreneurship in China, then profiles the strategy and the execution of the top Chinese companies including Alibaba, Xiaomi and Tencent. These companies are crucial to at least get to know the basics because they will play a very involved role in cryptocurrency and blockchain in China and the rest of Asia. To get an more in-depth understanding and more details on how tech companies operate in China, be sure to checkout Alibaba: The House That Jack Ma Built. The author has worked with Jack and at Alibaba for decades and details the hardships and encounters that led to the company to the largest IPO in the world in 2014, a whopping $25 billion. Through his decades spent in China, Evan Osnos shares how both powerful and ordinary people are remaking their lives as their country dramatically changes. Writing with great narrative verve and a keen sense of irony, Osnos follows the moving stories of everyday people and reveals life in the new China to be a battleground between aspiration and authoritarianism, detailing the clash between the rise of the individual and the Communist Party’s struggle to retain control. If you have basically no previous knowledge of China, this is a great short, integrated picture of modern Chinese society, culture, economy, politics and art all in one. This is a self-help book from Xiaolai Li, an celebrity educator turned entreprenuer and investor in China and manager of one of the largest crypto funds in China. Li published a book in Chinese to help Chives, a name given by the Chinese people to victims who get trapped in a loop of speculative investments, to helping them think through and manage the up and downs of the crypto market. In it, he lists out his advice for his chive disciple on how to be perceptive about the markets and practical tips for buying cryptocurrencies. Pingback: Here is the Most Comprehensive Travel Guide to Get Familiar with Mainland China and its Crypto Ecosystem – We help you think smartly about the crypto and blockchain landscape in Asia 5-10 years out.